Bognor’s remarkable season took another upward turn when they returned to the play-off with a battling 2-1 win away to Harrow. First-half goals by James Crane and Craig Robson extended their unbeaten league run and gave fans something else to cheer just three days after their brave FA Trophy defeat at Grimsby. You have to go back to December 19 to find the last time Bognor lost a league game, but they could have been excused for slipping up here with their two tussles with Grimsby having taken plenty out of them. They started superbly and had already seen a Jason Prior header cleared off the line by the time Crane put them ahead on three minutes, seeing another of his wonder-strikes from out on the left fly into the top corner. 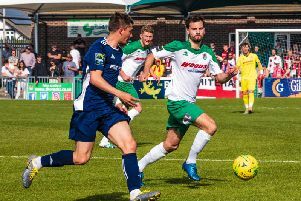 Bognor’s early joy was shortlived, though, as two minutes later Harrow were awarded a penalty for a trip in a messy penalty-box scrame and Mark Charles-Smith stepped up to beat Grant Smith. The Rocks were unmoved by the setback and controlled the first half. Straight from the kick-off after the penalty, Prior spotted the Harrow keeper off his line and very nearly caught him out with a long-range shot that was inches wide. They started superbly and had already seen a Jason Prior header cleared off the line by the time James Crane put them ahead on three minutes, seeing another of his wonder-strikes from out on the left fly into the top corner. A nice move between Harvey Whyte and Alex Parsons set up Ollie Pearce and his powerful shot was saved by Joe McDonnell. Harrow were struggling to impose themselves but they did manage an attack in which Chad Field expertly disposessed Charles-Smith and then Lewis Driver. Snorre Nilsen’s shot inside the box was deflected for a corner after good work by Robson - and Robson was rewarded when he met the resultant corner and shot home from 12 yards to give the Rocks the lead just before the break. Playing downhill in the second half, the Rocks started to look tired and Harrow began to build momentum. Smith - watched from the bench by new dual-registration keeper signing James Binfield from Pagham FC - made an excellent save from Drive, while at the other end Nilsen went close. Michael Bryan’s effort for Borough was wayward and Dan Beck replied for Bognor with a close effort. Robson twice cleared off the line in the space of 20 seconds as Harrow searched for an equaliser, first through Charles-Smith then Driver. Then Nilsen followed Robson’s lead and cleared one off the goal-line - before Smith made a superb double save. As the Harrow pressure continued, Smith came to Bognor’s rescue again, saving from Fejiri Okenabirnie and Charles-Smith again. Okenabirnie then headed a good chance over the bar, while the Harrow manager was sent to the stand for protesting over a throw-in. Bogonr brought otn Gary Charman and Stu Green and both helped them frustrate Harrow in the latter stages to hold on for three valuable points which put them fifth, and level on points with fourth-placed Dulwich, who have played five games more. Fatigue is bound to be a factor in the coming weeks for Bognor as they play catch-up but there’s nothing like winning form to help keep the spring in your step and that will be in their minds as they prepare to welcome Grays to Nyewood Lane on Thursday evening. Rocks: Smith, Whyte, Crane, Field (Green 78), El-Abd, Robson, Nilsen, Beck, Prior, Pearce, Parsons (Charman 68). Subs not used: Wollers, Binfield.